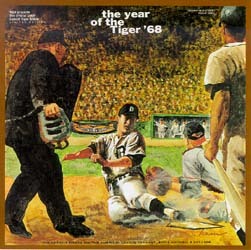 "The Year of the Tiger -- '68"
INCLUDES -- FOR THE FIRST TIME -- WORLD SERIES COMMENTARY! Relive the thrill, excitement, and glory of the World Series Champion 1968 Detroit Tigers, from the first days of spring training through their dramatic 7-game Series victory over the St. Louis Cardinals and the ensuing celebration. Narrated by Ernie Harwell and Ray Lane, this release chronicles a memorable season for a team from an era that is gone, but not forgotten -- when players played for the love of the sport and the appreciation of the fans. Who can forget all those late-inning come-from-behind heart-stopping wins; Denny McLain's 31 victories; the World Series showdown with Bob Gibson and Lou Brock. All to the background music of "Go Get 'Em, Tigers." The CD insert includes the original liner notes from Detroit Free Press sportswriter Joe Falls. Relive the dream -- pass on the legacy. "The Year of the Tiger -- '68"
A portion of the proceeds from this release go to the J.P. McCarthy Foundation.